ORELLANA PROVINCE, Ecuador — Widman Jimenez, a farmer in Ecuador’s fertile, but sometimes tumultuous Amazon region, has the intensity of someone who is driven by a cause. 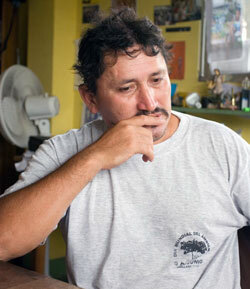 He is, in fact, an activist engaged in the environmental struggle against oil pollution. But right now another cause seems to be closer to his heart. His first wife, Maria, and their child died in as a result of a complicated delivery nine years ago. Now he is determined to make sure his new partner gets the best maternal care available. “The thought that the same thing will happen again is churning in my head,” he says. Widman lives 12 kilometres outside of Coca, a small urban spot in the vast Amazon rainforest in Ecuador’s Orellana province bordering Colombia. He cultivates yucca, corn and chontaduro, a fruit that grows on a certain type of palm tree. A year ago, he met and fell in love with Sonia. At the time of this interview, Sonia was six weeks pregnant. "She wants to give birth at home but I don’t want her to,” he says. “Because if there are complications, you don’t know how to handle them.” He talks about bringing Sonia to the capital to make sure that she gets the best care.
" If you don’t know anybody, the doctors may not even want to help you. If you are from the countryside they look at you differently." He is also concerned about discrimination. “If you don’t know anybody, the doctors may not even want to help you. If you are from the countryside they look at you differently,” he says. That was his experience nine years ago, when he and Maria arrived at the hospital in Coca, late one evening after her water broke. “There was no one in the hospital, not a doctor, or a nurse.” He found a midwife, but she would not help, because she was afraid there might be complications that she could not handle. When the couple finally found a doctor in an office across from the hospital, they had to wait until he had finished treating other patients. “At that moment, I felt calm, because I trusted the doctor.” But then several hours went by and nothing happened. He heard a lot of commotion in the room next door. The doctor’s wife came in with reassurances, but then a little later, the doctor came out and announced that she was dead. 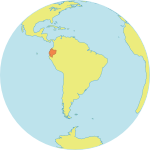 The maternal mortality rate for Ecuador is about 130 deaths per 100,000 live births, according to UN figures , placing the country in the mid-range among its Latin American neighbours. However, these figures mask wide disparities within the country according to region, socio-economic group and locale. Health officials also believe the official estimates may be low because of significant numbers of unregistered maternal deaths. Isabel Goicolea, a Spanish doctor who works for the Amazon Health Foundation (FUSA), which is supported by UNFPA, the United Nations Population Fund, describes the access to skilled health services in rural areas of the province as ‘incredibly low’, compared with urban areas. In cities, 76.5 per cent of women receive skilled maternal care, while only 15 per cent of the indigenous Quichua women do. The entire Orellana province is served by one hospital with only 15 beds, in addition to a few rural clinics. 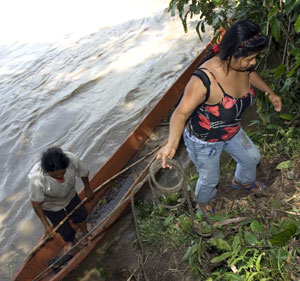 In the Amazon region, the maternal mortality rate is considerably higher than the national average. An investigation carried out over six months in 2004 revealed a maternal mortality rate of 300 per 100,000 live births for the province of Orellana – more than twice the national average and higher than in most countries in the region. “We looked at all the deaths of women of childbearing age to find out what was the real cause of their deaths. None of them were registered as maternal deaths, but nearly all of them were,” says Goicolea. 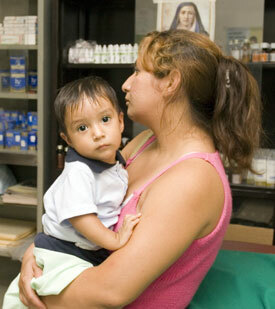 A 1998 law guarantees all pregnant women and their children (up to age five) free health care. Some people claim that the law is ‘just a piece of paper’ and does not ensure free care for all, but members of a national network, supported by UNFPA, of ‘User’s Committees’ work to ensure that the law makes free maternal care accessible to all. The system is far from flawless, but the User’s Committee in Coca keeps pushing to solve problems like shortages of physicians and free medicines, discrimination based on race and social class, language problems (for indigenous groups), and in some cases unwillingness by physicians to comply with the law. While the committees can help make sure that pregnant women receive better quality care without being charged for it, health authorities are responsible for expanding access to services. Rosa Japon, Provincial Health Director for Orellana, says the province is now extending its network of rural clinics, so as to improve access to skilled health services and emergency care for the rural population. The provincial health department, in cooperation with local authorities and grassroots organizations also organizes ‘health brigades’ – small groups of health professionals who travel by boat, car or even horseback to remote indigenous communities to offer health services and family planning methods. The health department is now working with facilitators recruited from the different indigenous groups to spread information about health care and offer basic health services. UNFPA supports the effort to reach remote communities nation-wide and to improve the quality of maternal health services by training public health personnel in emergency obstetric care and providing methods for family planning. “We want all women in Ecuador to be able to demand good quality maternal care, based on human rights and their right to health care,” says Mercedes Borrero, UNFPA Representative in Ecuador.